Cleaning is relatively simple as long as it is done regularly and excessive wear is avoidable if correct placement is considered. But carpet, tapestry or any textile repair is rather more involved and should only ever be undertaken by a professional restorer. 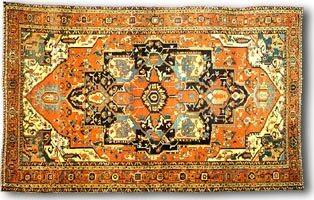 Follow the few pointers below to ensure your antique carpets and tapestry remain in first class condition and that you don’t inadvertently cause some easily avoidable damage. 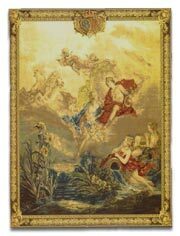 Caring for your valuable antique carpets and tapestries. 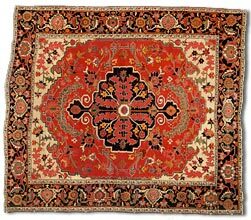 If they are kept free of dust and placed where they will not be subject to heavy wear, then many antique carpets and rugs can be used normally. If hung against the wall or in use on the floor antique carpets and rugs should always be against a clean flat surface. Floor carpets should have an underlay with a slightly tacky surface to reduce slip and it should be cut to fit their size exactly. Never ever nail or glue a valuable carpet to anything. On stone or tile floors lay moisture proof paper beneath the underlay. Think carefully before siting antique floor carpets. They are likely to suffer the least wear in a bedroom. If placed before an open fire they risk being scorched or if under a dining table they may be stained by food or drink or damaged by movement of chairs. Rubber pads or wooden cups which are available from most good furniture stores, will relieve the localised pressure of furniture feet. Move your carpets around occasionally so that the wear is not always concentrated in the same area. Delicate or rare items should only ever be wall hung length ways so that the weight is taken by the warp. Small items can be mounted by a specialist framer onto a linen backing and fitted into a wooden stretcher and then box mounted with a Perspex window for further protection. For larger textiles, stitch wide Velcro tape along the top edge of the back (taking care to sew between the carpet threads and not through them), and staple the receiving velcro strip to a wooden batten fixed to the wall. Heavy textiles may need additional support tapes running vertically down the back to help spread the weight. Dyes fade in intense light from bright sunshine or spotlights. So use cool-beam, fibre optic or low wattage incandescent lights for any highlighting effect and draw curtains when a room is not in use during the day. Cleaning Antique Carpets and Tapestry. Major cleaning, beyond dust removal, should be kept to a minimum and should always be done by a professional carpet cleaner or restorer. 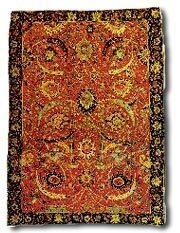 Proprietary carpet cleaners should never be used on antique carpets or tapestries, as they can have a clogging effect. If a carpet is tough enough to be used it will benefit from regular vacuuming. Make sure to vacuum in the direction of the pile and vacuum the back and the floor beneath about every six months. For a fragile or wall hung carpet or tapestry it may be sufficient to take out loose dirt regularly. Always use a low suction setting or fitting on the vacuum cleaner and fix a fine mesh net or stocking over the nozzle using an elastic band. Clean both the back and front every six months and if possible do this during the summer months when moths are breeding. Treat accidental spills immediately and soak up surface liquid with a white paper towel or clean colour fast tea towel. Sprinkle table salt liberally over any stain to draw out the remaining moisture then vacuum when dry. A good dowsing in soda water that is then soaked up with clean towels is effective for urine and other light stains. Soak old stains in a solution made up of two tablespoons of salt to a pint of water; but beware salt can have a bleaching effect. A carpet made after 1870 and up to 1920 may contain synthetic aniline dyes, that were of variable fastness when first introduced, so always do a spot test. Wax can be gently lifted off with a finger nail and the remainder absorbed into white blotting paper pressed on with a luke warm iron. Remove chewing gum by pressing with an ice cube in a plastic bag to chill and harden it, then ease off gently with your finger nail. If any of the above methods do not work easily a stain should be left until it can be treated by a professional conservator. For long term storage choose a cool dark well ventilated place. Folding will cause creases and uneven wear, so roll the carpet or rug right side out, around an acid free cardboard or inert plastic tube of as wide a diameter as practicable. (a plastic drain pipe is ideal). Roll in the direction of the pile, from the top of the carpet the pile moves smoothly away from the top like a cats fur when stroked in the right direction. With a tapestry weave in the direction of the warp. Smooth out as you roll and interleave with acid free tissue. Finally, tie a dust proof sheet around the roll and store it horizontally, never vertically, as this distributes the weight unevenly. Fraying, holes, burns or other damage to antique carpets or tapestry must be repaired by a specialist. Expert repairs involve exact matching of dyes, threads and knots, and may possibly require the insertion of a patch or of reinforcing the warp and weft.